Ekalawya or Ekalavya is a hunter from the lowest caste in India called Nisada. His passion to learn about archery leads him to leave his beautiful wife Dewi Anggraini then seeks for guidance from Resi Drona or Durna, the teacher of Panca Pandawa and Korawa. Ekalawya is dissapointed once he meets Drona. The latter says he does not want to teach Ekalaywa because he is not from noble caste. Besides, Drona wants only Arjuna, his most beloved student, to be the best of all archer. Ekalawya’s steps to learn does not stop there. He then resides in a forest and master his archery skill by himself. To honor Drona, who never teaches him at all, he creates a statue which looks like his imaginary teacher. Ekalawya gradually becomes so skilled thanks to his continous training. In one of his training days, he shoots at a dog with an arrow without even looking at the animal. The Pandawa find the animal then become curious on the archer. Ekalawya thus admits his deed. He introduces himself as the pupil of Drona. Finding out this fact, Arjuna becomes depressed. He starts to think he may not be the most genius archer. 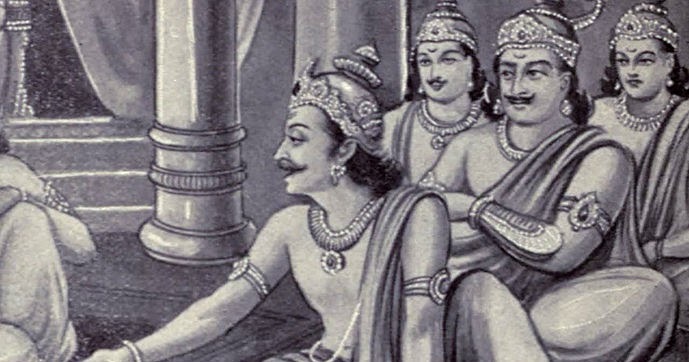 Drona can read Arjuna’s mind. Both of them depart to the forest where Ekalawya lives in and studies. Drona humiliates Ekalawya after the fake student pays him a homage. Drona calls Ekalawya as an immoral person who keeps on regarding the former as his teacher despite earlier rejection. Surprisingly, Drona asks for Ekalawya to do Dakshina, teacher’s request for a student as a form of gratitude. Drona demands Ekalawya to cut his right thumb. Without hesitation, Ekalawya fulfills Drona’s request although he knows this will makes him hard to shoot with arrows and bows. One of the announcer says Ekalawya dies during his archery battle against Arjuna. The most handsome son in Pandawa still needs to face Ekalawya to convince himself that he is the most skillful archer although he knows his opponent candidate already loses his right thumb. The rivalry goes on fairly at the beginning. Both of them can shoot at animals with arrows precisely until they lose targets. At the end, both archers face each other. Who shoots faster will secure his life from death. Ekalawya knows Arjuna’s game. He intentionally deccelerates his shooting with an arrow and a bow thus dies. 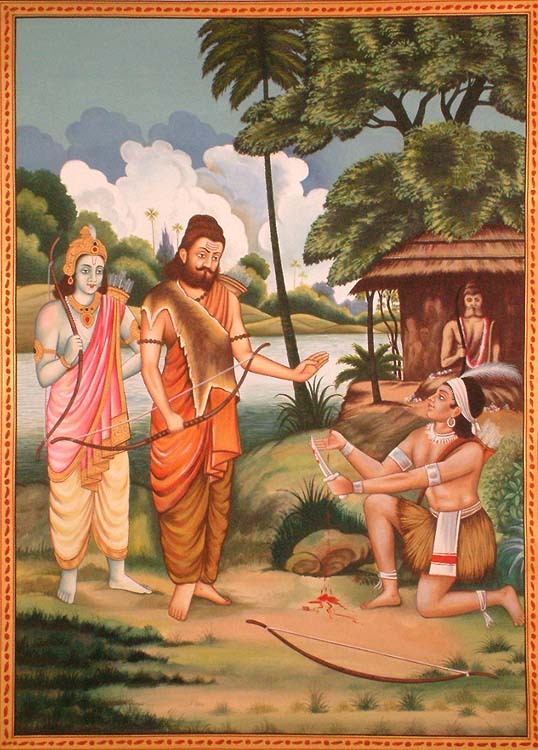 Many believe this moment turns out into a karma when Drona is killed in Baratayudha war. The spirit of Ekalawya descends to Arya Drestadyumena who cuts Drona’s head during the war. Whereas Wikipedia says Ekalawya dies in a war against Yadawa troops. Javanese puppet has a different version. Ekalawya or Ekalaya is actually the prince from Paranggelung kingdom. He is already a master in archery. He seeks for Drona to learn Danurwenda spell but is sent away because Drona swears he will only teach Pandawa and Korawa. Ekalawya thus learns on his own. His conflict with Arjuna arises as he receives complaints from his faithful wife Dewi Anggraini that the most good-looking man from Pandawa wants her. Arjuna dies in the battle but Kresna helps him to be alive again ( it does sound weird). Ekalawya eventually dies after he loses his thumb where he puts Mustika Ampal ring following a tricky game with Arjuna. The prince vows he will kill Drona. During Baratayudha war, the spirit of Ekalawya descends to Arya Drestadyumena who cuts Drona’s head.